Putting a name to many spiders requires their capture and the use of a microscope, especially the tiny money spiders (Linyphiidae). Fortunately, some of the larger ones are readily identifiable. 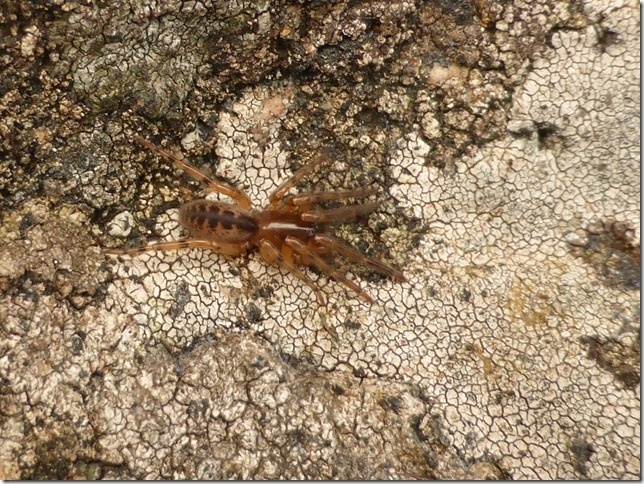 An example is this six-eyed spider, Segestria senoculata, which Gwen Richards photographed on 4th March 2016 on a rock outcrop near Cnoc a’Gharbh Doire (NC122312) on the Drumbeg peat track. Its abdomen bears a dark central band, consisting of a series of lobes connected by narrow necks, ‘reminiscent of the pattern on an adder’s back’ as the great arachnologist W.S. Bristowe puts it in his book The world of Spiders (1958). This spider is about 9mm long and lives in a silken tube in a crevice in a wall or under a stone, from the mouth of which extend a dozen stout threads acting as ‘fishing lines’. It is one of some ten species of six-eyed spiders found in the British Isles; the rest have eight eyes. Only one other member of this group has been found locally, the tiny pink Oonops pulcher, which can occur in buildings.